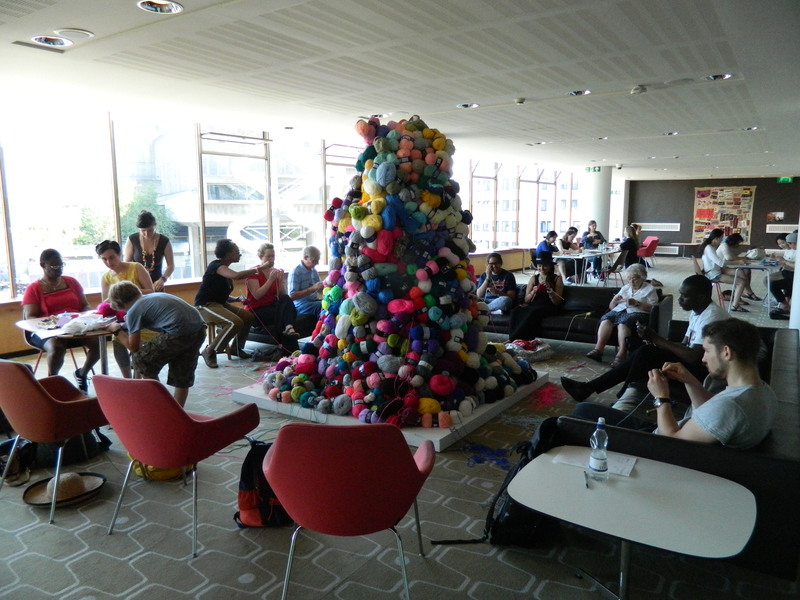 Yarn mountain was commissioned for the Festival of Love 2015 at the Royal Festival Hall, Southbank Centre, London Summer 2015. It was part of LOVE the YARN: Lasmin Salmon in collaboration with Celia Pym. Lasmin Salmon and I met through ActionSpace where Lasmin is an artist and I was a studio volunteer. Both of us are knitters. 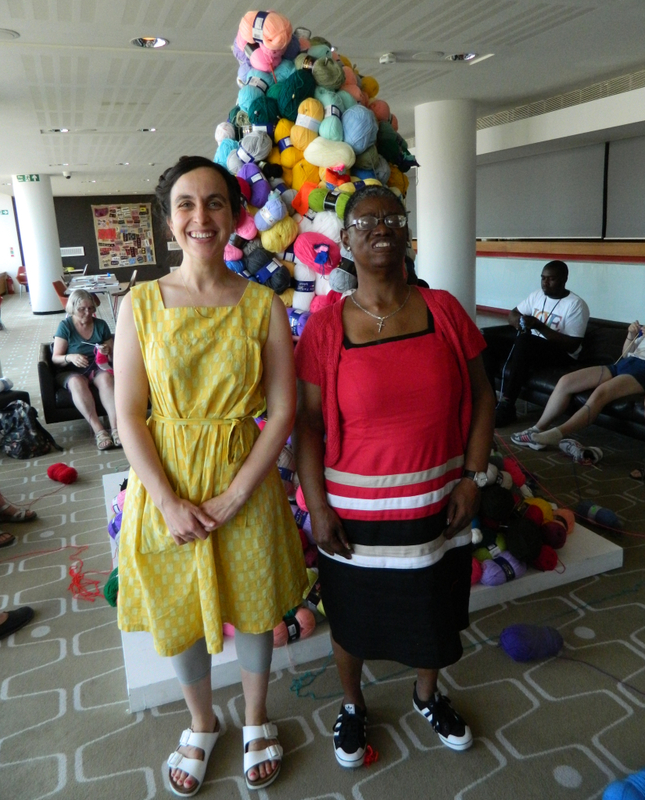 We started working together, sitting and knitting side by side, sometimes exchanging pieces of knitting and adding them together, cutting them up, sandwiching them with stitch or knitting into the others’ work. For the Festival of Love, I built a Yarn Mountain. Inspired by Lasmin’s delight and pleasure in a massive pile of wool, its colour and potential for knitting. 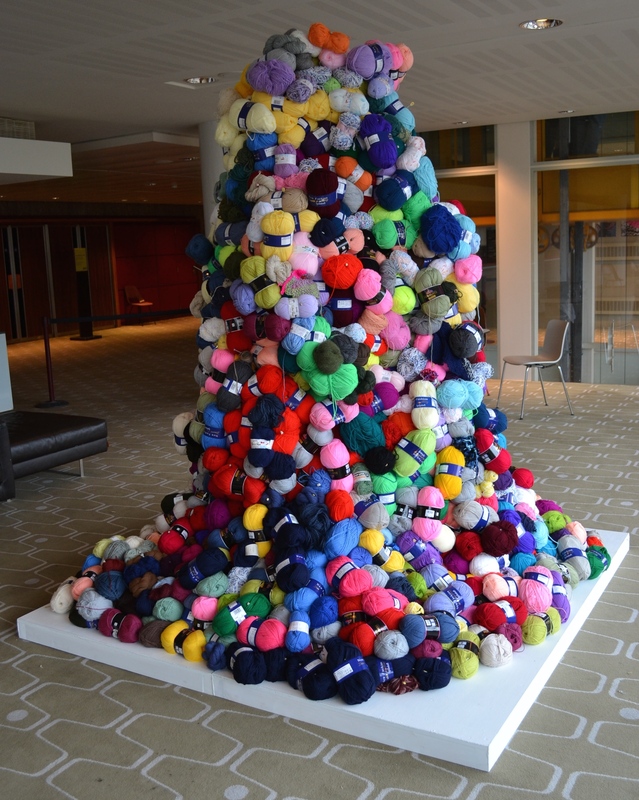 The mountain was accompanied by a notice letting Royal Festival Hall visitors know that there were 3 knitting days. These knitting days were key events for the mountain, when it came to life. We laid out cast on needles that drew yarn from the mountain for visitors to pick up and use. Lasmin had a spot on the window side where she would set up and knit and I would move around available to teach visitors how to knit or knit myself when the space was quiet. 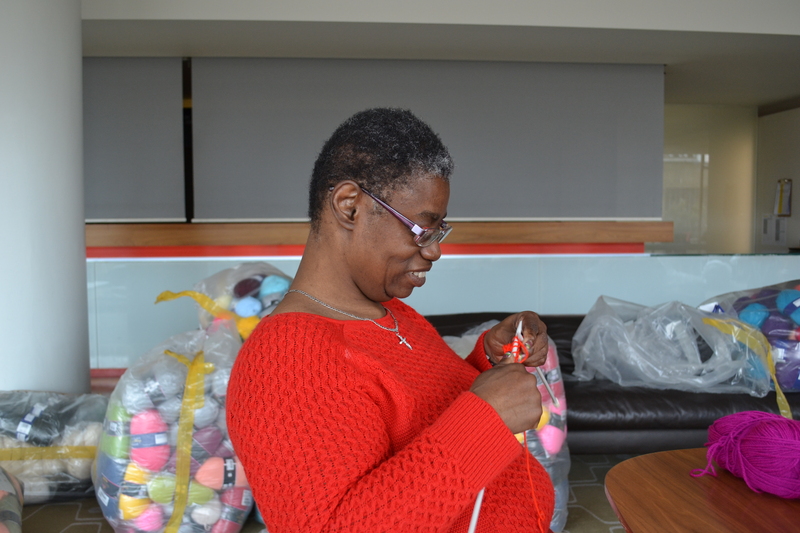 The plan was to knit for the pleasure of knitting in the company of strangers and friends. All were welcome, no experience necessary and all pieces were pinned to the mountain as markers of knitters’ visits. LOVE the YARN exhibition also included photographs of the knitting exchanges made between us and Rug, 2014 by Lasmin, a large stitched piece of work she made of small sensitive rings pieced together on a 2m square ground. Lasmin Salmon is an ActionSpace artist. She works primarily in textiles, her work expresses a beautiful, warm and generous nature; reflected in her bright colour choices and inquisitive fascination with circles and the stitched edge.